This is some killer punk out of Madrid, Spain on that throwback tip. If you had told me this was some recently excavated ‘80s gem getting the reissue treatment I’d have no reason not to believe you. 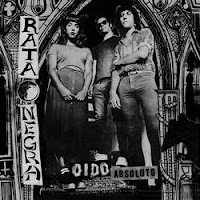 Even the band photo used on the cover—which itself looks like it was clipped from an old photocopied zine kicking around your dad’s attic—looks like three loonies making the scene in ’82 or something. Alluring, moody melodies float atop post-punk-informed instrumentation. A lot of stuff like has gained traction of over the last five years or so, and for good reason. The vocalist is the glue that ties this trio together. Her delivery isn’t abrasive, rather tuneful, but in a way that is still undeniably punk. This reminds a little of that that La Misma record from a couple years back (also on La Vida, go figure), albeit less aggressive. There’s a handful of quick, to-the-point numbers here, but the longer songs—those that surpass the 2:00 minute mark—where they allow themselves some wiggle room, are the standouts. See “Por No Estar Sola” and “Viviremos Eternamente” for example. The latter of which makes me think of the Nic Cage movie Valley Girl, but for reasons that aren’t quite clear.